Huntress's mask includes a built-in radio transmitter/receiver that links directly to Oracle. Her costume is made of a Nomex fire-resistant Kevlar material that also contains many pouches for lock picks, a first aid kit and a flashlight. Weapons include a variety of edged weapons, including throwing knives, darts and a compact crossbow that can fire either regular bolts, or custom designed payloads. History: At present, Oracle does not know Helena Bertinelli personally. She is, however, an acquaintance of the Huntress. And perhaps it is only a matter of time before Barbara Gordon figures out that her occasional ally is actually the sole surviving member of a mob family murdered by rival factions of the city's Mafioso. In her youth, La Cosa Nostra robbed Helena of her parents and brother, forcing her to seek refuge among Sicilian relations. Trained to fight by her cousin, Helena later returned to Gotham, determined to hunt down the men who ordered and carried out her family's destruction. Her retribution involved dismantling the organization to which she was once bound by blood. As the Huntress, Helena armed herself with crossbow and knife, stalking Gotham's organized crime figures with a violent intent. The city's Dark Knight defender, Batman, has tried time and again to temper her methods, even nominating her for membership in the Justice League of America, though he later had her membership revoked. But, through it all, the Huntress has remained unwilling to compromise her convictions. 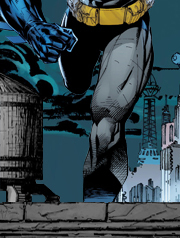 Most recently, Helena found herself a pawn of Checkmate, an ultra-secret law-enforcement agency which offered the Huntress its "Queen" position in exchange for information on the Dark Knight. With Batman's help, Helena accepted Checkmate's offer without betraying him. 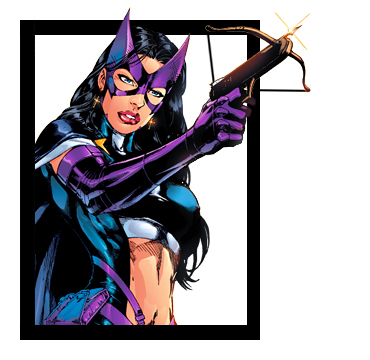 There is little doubt that the Huntress plans to extricate herself from Checkmate's control. Time will tell if Oricale has the means, or desire, to make the Huntress another of her trused Birds of Prey.